*This article is part of the doctoral thesis entitled Scenarios of future expansion of biofuels in Colombia: impacts generated by the expansion of oil palm plantations to produce biodiesel. The study was funded by the Instituto de Estudios Ambientales, Universidad Nacional de Colombia. Castiblanco, C., & Etter, A. (2013). Biofuels as a New Energy Paradigm: the Key Points of Debate after a Decade. Cuadernos de Desarrollo Rural, 10 (70), 69-92. Biofuels are promoted worldwide as an alternative to partially replace fossil fuels. After more than a decade of implementation, important questions have been raised concerning: i) the impacts generated by the change of use and land coverage; ii) the impacts on prices and food production, iii) the impacts on water and the related ecosystem services, and iv) greenhouse gas (GHG) emissions generated by the changes of land use. This article discusses these issues in the current situation of biofuels with emphasis in the tropical countries. Available studies show that despite their small contribution to the world energy matrix, the large-scale expansion of biofuels can generate negative impacts such as increase in the competition for water and land, especially in the vulnerable ecosystem and social structures in tropical countries. Keywords author: Land use change, food, ecosystem services. Keywords plus: Biomass energy, agriculture and energy, agricultural wastes as fuel, environment, social development. Los biocombustibles se promocionan en el mundo como una alternativa para la sustitución de combustibles fósiles. Después de más de una década de su desarrollo, persisten serios cuestionamientos con relación a: i) los impactos generados por el cambio de uso y cobertura de la tierra, ii) los impactos en los precios y producción de alimentos iii) los impactos sobre el agua y los servicios ecosistémicos relacionados y iv) las emisiones de gases efecto invernadero generadas por los cambios de uso del suelo. Este artículo presenta una revisión crítica de estos aspectos, enfocada particularmente en los países del trópico. Los principales resultados dejan ver que a pesar de su escasa contribución a la matriz energética mundial, la expansión a gran escala de los biocombustibles puede generar impactos muy negativos, al intensificar la competencia por el agua y la tierra, especialmente en los países del trópico, que se caracterizan por poseer ecosistemas y estructuras sociales muy vulnerables. Palabras clave autor: Cambios de uso de la tierra, alimentos, servicios ecosistémicos. Palabras clave descriptores: Energía biomásica, agricultura y energía, residuos agrícolas como combustible, medio ambiente, desarrollo social. Les biocarburants sont promus dans le monde comme une alternative au substitution des combustibles fossiles. Après plus d'une décennie de son développement, il existe encore de sérieuses questions en ce qui concerne: i) l'impact causé par le changement d'utilisation et la couverture du sol, ii) Les effets sur les prix et la production alimentaire, iii) les impacts sur l'eau et les services écosystémiques associés, et iv) les émissions de gaz à effet de serre, générées par des changements d'utilisation des terres. Cet article présente une revue critique de la situation actuelle des biocarburants dans ces sujets, axée en particulier dans les pays tropicaux. Les principaux résultats montrent que malgré sa petite contribution à la matrice énergétique mondiale, l'expansion à grande échelle des biocarburants peut avoir des impacts très négatifs, pour l'intensification de la concurrence par l'eau et la terre, en particulier dans les pays tropicaux qui se caractérisent pour avoir des écosystèmes et des structures sociaux très vulnérables. Mots-clés auteur: Changements dans l'utilisation des terres, nourriture, services écosystémiques. Mots-clés descripteur: Biomasse énergie, l'agriculture et l'énergie, déchets agricoles comme combustible, l'environnement, développement social. Energetic security constitutes a major strategic issue for all countries worldwide. Geopolitical tensions around the territorial control of oil, and global climate change issues represent some of the reasons that have led to search for sustainable energy alternatives. Biofuels are a renewable option to substitute part of the fossil fuels used in the transportation sector, and have been growing very fast during the last decade (FAO, 2008; Mandil & Shihab-eldin, 2010; OECD-FAO, 2011). Liquid biofuels can be manufactured from several agricultural and forest products. On that account, ambitious programs and policies have been implemented during the last decade in order to promote its manufacturing and use in center and periphery countries. The production and consumption of biofuels also seeks to: i) mitigate the Greenhouse Gas (GHG) emissions; ii) encourage investment and promote development in rural areas; iii) diminish poverty; and iv) increase exports (REN21, 2011; OECD-FAO, 2011). Public policies have played a significant role in the exponential growth of biofuels (ethanol and biodiesel), which has increased during the last decade from 18,000 million liters in 2000, to 129,000 million liters in 2011 (FAPRI, 2011). Nevertheless, biofuels still represent a limited contribution in the world energy matrix. In 2009, renewable energies constituted only 16% of the global energy offer. Of these, 60% come from fuel wood primarily used for cooking and heating in rural areas of developing countries, while only about 5% corresponds to biofuels (REN 21, 2011). As with other energy sources, biofuels present risks and opportunities which depend on the type of feedstock used, the transformation process, and the social and economic contexts (Dufey & Stange, 2011). After more than a decade of biofuels promotion and development worldwide, the current debates focus on four major topics: i) the impacts generated from land-use and land cover change (biodiversity, GHG emissions, soil degradation); ii) the implications on the access, ownership and distribution of land; iii) the fluctuations of food prices; iv) the impacts on water use and ecosystem services related to water resources. The objective of this article is to present an overview of the current status of biofuels in relation to the above-mentioned topics, with emphasis in tropical countries. This is divided in three parts: i) a general overview of global biofuel market evolution in the last decade; ii) a review of the academic debate in relation to land cover change, access to land, food prices and ecosystem services related to water regulation and greenhouse gas reduction; iii) a discussion of the main points from the perspective of the rural communities. To discuss how biofuel market has evolved in this ten-year period, we will present some aspects of its growth dynamics, how it behaves currently, and the overall demands relating to crops, land and environmental issues. We will also mention the role that new technologies play in the biofuel market and the particular challenges they establish in the developing countries. During the last decade the growth of biofuels increased responding to demands, crops, land, environmental issues and technological innovations. 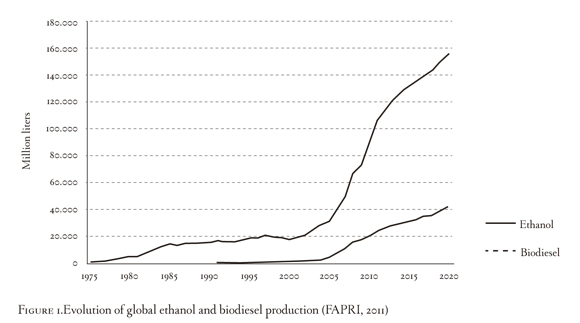 Between 2000 and 2010, the production of biofuels increased at an average annual rate of 12% for ethanol and 27% for biodiesel, with a partial slowing during the global financial crisis of 2008 and 2009. The collapse of capital markets and productive activities impacted biofuel production due to restrictions to credit access, the decrease of the price of oil and the consequent fall of the demand for biofuels (Dufey & Stange, 2011). However, the global production of biofuels grew again 13.8% in 2010, accounting for 86,870 million liters of ethanol and 19,800 million liters of biodiesel. This was one of the most significant increases in the supply of liquid fuels within the decade (Figure 1). In 2010 liquid biofuels contributed to a record 2.7% of the energy used in the transportation sector worldwide (REN 21, 2011). However, at least three factors can be identified as restrictive for the biofuel market growth: national protection policies for biofuel production, the focus on few agricultural products as main inputs, and the new environmental requirements imposed to the industry. First, the international biofuel market is rather limited because a major part of the production is used as domestic consumption. In general, governments protect local production, and the trade is therefore highly affected by commercial preferences and barriers, particularly in countries where biofuels are part of strategies oriented to support rural producers (Dufey & Stange, 2011). Some countries in the European Union and USA have trade agreements that grant a preferential access to certain countries. On the other hand, the financial assistance for production is also a significant trade barrier. For instance, USA supports ethanol industry with US$5,500 to US$7,300 million annually (Koplow & Track, 2006), while the European Union grants a financial support of 0.52 Euros per liter (Steenblik, 2007). Second, the type of crop, its productivity and the potential expansion of croplands for biofuels are also issues that affect the market. Between 2000 and 2010, the most used energy crops for ethanol production were sugarcane and corn. For biodiesel production the main feedstock were oil plants such as rapeseed, soy and palm oil (Dufey & Stange, 2011). It is estimated that croplands currently used as feedstock for biofuels occupy an average of 14 million hectares, which is about 1.6% of the global agricultural land (OFID-IIASA, 2009). The potential for cropland expansion is mainly located in South America and Sub-Saharan Africa. The global growth of land used to cultivate food and feed is expected to add an additional area of around 98 million ha by 2020, and 147 million ha by 2030 in comparison to 2000. The expansion of biofuel production will be reflected in an additional use of agricultural lands and it has been estimated to reach 35 million ha by 2020, of which 13 million ha would be located in developed countries, and 22 million ha in developing countries (Mandil, & Shihab-eldin, 2010; OFID-IIASA, 2009). Third, in relation to environmental issues, it can be said that the sustainability concerns are becoming increasingly important and constitute a requirement in order to have access to the main markets (Dufey & Stange, 2011). As a response to potential environmental impacts of large-scale biofuel expansion, the main importing countries (particularly the EU) have implemented certification schemes oriented at guaranteeing biofuels sustainability. These initiatives are pioneered by the Netherlands, the United Kingdom and Non-profit Organizations, and cover aspects such as mitigation of GHG emissions, local environmental impacts on soil and water, and impacts on social aspects and food production (Scarlat & Dallemand, 2011). Developed countries (OECD) and other countries with emergent economies have been carrying out important research and investments in advanced biofuels. Additionally, a set of voluntary and mandatory norms and practices has been implemented. For instance, The United States Congress established a mandate to promote the production of cellulosic ethanol, in order to achieve 950 million liters in 2011, which the Environmental Protection Agency (EPA) reduced to only 30 million liters for 2012 due to environmental concerns (Fairley, 2011). On the other hand, the European Commission (EC) included indirect land-use changes in the Renewable Energy Directive 2009 which only accepts biofuels whose carbon footprint is at least 35% lower than gasoline, a threshold that will be increased to 60% in 2018 (IEA, 2010). In the future, a large portion of biofuel production must be achieved by shifting to a wide variety of non-food materials (seeds, and wastes of leaf, stem, weed and oil) or wild crops that grow in marginal lands, known as "second generation" biofuels (Fairley, 2011). However, "secondgeneration biofuels" (non edible sources) present higher production costs compared to the first generation biofuels and fuels derived from oil. Production and selling costs of cellulose ethanol are US$1.10 per liter of oil equivalent (about US$4 per gallon), whereas the equivalent production and selling costs of a corn ethanol liter oil is US$0.75, cane ethanol US$0.62, and conventional gasoline US$0.54 (Fairley, 2011). On the other hand, the establishment of extraction and processing plants require a higher capital investment because the operation scales will also be larger. The IEA (2006) indicates that in the USA an investment of US$375 million is needed to install a cellulosic ethanol plant with a capacity of 50 million gallons per year (2005 US dollar price). At present the USA focuses on the research and development of new technologies with the objective of reducing the costs of cellulosic ethanol to half (Timilsina & Shrestha, 2011). In general, developing countries must face additional difficulties when it comes to developing second generation technologies, such as: improving road and agricultural infrastructure, qualifying labor force, enhancing financing possibilities, implementing and integrating into sustainability evaluations aspects related to land-use, land access and rural development strategies, and creating the conditions for improved cooperation and technological transfer with industrialized countries. Investment will also be required to promote research for the: identification and availability of suitable land, technological development, assessment of impacts derived from production and commercialization of second generation technologies, study of the local agricultural markets, materials flow, and finally, the analysis of the social, economic and environmental benefits and risks (EIA, 2010). Although biofuels are an interesting alternative from the perspective of energy crisis and global warming, its large-scale production implies significant risks, particularly for tropical countries, with effects of production and use going beyond the production chain (ABN, 2007; De la Torre Ugarte, 2006; Fajardo, 2009). The process of land acquisition and plantation development in biophysically and socially heterogeneous regions can cause negative collateral ecological effects, reflected on indicators such as biodiversity, food security, inflation, and land and wealth distribution in developing countries, because institutions are often weak and there is a lack of mechanisms to strengthen property rights (Fajardo, 2009). A direct land-use change (DLUC) is produced when a new agricultural activity is developed in a particular area, creating land cover/use transitions, which can be directly observed and measured using mapping techniques. An indirect land-use change (ILUC) reflects an unwanted consequence of land-use decisions in other neighboring or far away places. Unlike DLUC, an indirect change is often very difficult to observe or measure, or be isolated from other factors which are also contributing to those land-use changes, for example profitability decreases or modifications in support policies (Young, 2011). ILUC is a matter of concern because the areas oriented to biofuel production can displace other agricultural activities towards lands whose land cover are important carbon reservoirs, or food production. A large amount of GHG emissions is generated from land conversions, that counteract any reduction obtained from the implementation of biofuels (Croezen, 2010). Amazon, has been documented by Goldemberg and Guardabassi (2009) and Gao et al. (2010). In the period 1997-2007, the cattle heads in the Amazon region showed a 78% increase, and currently this region hosts 35% of the cattle in the country. Precise figures for GHG emissions from such indirect land-use changes are still missing, but it is estimated that they could exceed carbon savings resulting from biofuel use (Schlesinger, 2010). Griffiths (2010) discusses the case of the oil palm company Sime Darby in Malaysia, which sells both, certified and non-certified palm oil. From 65 production units only 5 are certified by the Roundtable on Sustainable Palm Oil (RSPO), which provides palm oil to produce biofuels. The remaining 60 units depend on non-certified plantations located in tropical forest ecosystems in Liberia (Africa) and new plantations in Western Kalimantan (Indonesia) mostly producing edible and cosmetic oils. Although the RSPO promotes the sustainable growth and use of oil palm products through global standards and investors commitment, it does not approach to the issue of land-use change (Scarlat & Dallemand, 2011). As a result, several RSPO certified companies such as IOI and Cargill have expanded their plantations in forestlands. These companies fulfill the EU sustainability criteria for biofuels, and they will continue expanding to other zones in order to satisfy the additional oil palm demand for other uses, generating indirect GHG emissions. This means that RSPO certification does not warrant sustainability and it will not prevent deforestation because the RSPO does not deal with the issue of land-use change (Griffiths, 2010). The case of DLUC in Indonesia is alarming: having the largest tropical forest cover of tropical Asia, this country has also had one of the highest deforestation worldwide: 5.39 million ha of forests disappeared between 2000 and 2008 (9.2% of Indonesia remaining original forest in 2000). More than 2 million ha of forests (including protected and conservation areas) have illegally become oil palm plantations (Koh & Ghazoul, 2010). Similar cases in Malaysia and Thailand have been documented by Wilcove and Koh (2010), Dillon and Laan (2008). Nevertheless, the DLUC patterns are highly variable. In Colombia for example, changes resulting from the expansion of oil palm plantations have been different in spite of their environmental concerns: most new plantations in the 2002-2008 period in at least 50% of the cases replaced former pasture areas, mostly of low productivity cattle grazing (Castiblanco et al. forthcoming). The replacement of natural vegetation such as tropical forests and savannas only occurred in 7.7% and 5% respectively; but it has also impacted agricultural areas in 30% of the cases. In this case the knowledge about the ILUC is still missing and needs additional research. However, in relation to ILUC, it is important to mention that not all the biofuels generate negative impacts. For instance, in some cases the use of feedstock for biofuels can be compensated by biofuel co-products, which are generated during the manufacturing process. These co-products can be used directly to substitute food for animals or for energy generation, which leads to a limited and even a negative demand of additional land (Young, 2011). Finally, ILUC are not an exclusive phenomenon of biofuels. Any additional demands in the global agriculture system have a potential to generate ILUC. Currently biofuels represent a small amount of the global agricultural production (approximately 2%). Also non-agricultural activities can result in ILUC impacts, such as oil exploration and exploitation, mining activities, urban expansion or establishment of new infrastructure (Young, 2011). The implications of biofuels on land access vary depending on the type of feedstock, land ownership systems and biofuel production models (from local self-sufficient energy models to large scale plantations for export). Implications also depend on the role that the agriculture plays in a national economy. In general, countries with a high rate of rural population, a high contribution from agricultural GDP in their economy and a high availability of natural resources, will experiment a greater impact from land-use and cover changes (Cotula et al., 2008). Cotula et al. (2008) show how government policies direct sector support changes in land prices and determine the forms of access and distribution. The support policies to the biofuel sector tend to be broadly reflected in an increase of the price of land, and the cost of agricultural inputs. When the land demand grows and the market is limited and informal, the opportunity cost increases and the most profitable uses are selected. Profitability in agriculture strengthens the tendency towards higher land prices, particularly in the more fertile areas, circumstances under which the less profitable crops are displaced to least productive zones, such as pastures, forests or abandoned lands. The increases in land prices contribute to land concentration in fewer owners who have access to capital and infrastructure resources, especially in regions where there are strong power assymetries, lack of transparency and weak support from legal frameworks that establish property rights, agricultural and environmental policies, and create questionable incentives for land use and access (Cotula et al., 2008). In the long term, the growing of biofuel production will cause changes in the land property, making the access to land for marginal groups more difficult (Cotula & Neves, 2007). Specific groups such as itinerant farmers, women and small producers will tend to experience land exclusion because the land price increases (Cotula & Toulmin, 2007). This can also be seen in developed countries, where only 5% of women farmers own their lands (IFPRI, 2011). This fact is even more relevant in cases where a considerable number of women are widows and single mothers due to the armed conflict, which makes them more vulnerable to displacement towards marginal lands, when land prices increase (Cotula et al., 2008). A potentially important impact of first generation biofuels is the impact on production costs and food prices. Ewing and Msangi (2009) for example, show that the corn production for ethanol in the period 2002-2007 in the USA was responsible for the 30% price increase of wheat and secondary cereals. These authors also indicate that in the same period, 93 million tons of wheat and secondary cereals, and 81 million tons of corn (a quarter of the entire corn production in USA) was used for ethanol production. According to the International Monetary Fund (IMF), the global growth of biofuel production explains the average of 12% increase of food prices between 2006 and 2008. In addition to that, the International Food Policy Research Institute (IFPRI), also estimates that the growing demand for bioenergy represented a 30% weighted price increase of grains between 2000 and 2007 (Tirado et al., 2010). On the other hand, there is evidence that the higher the oil prices, the stronger the bond between biofuels, land-use changes and food security (Dufey & Stange, 2011). The more expensive oil becomes, the more profitable biofuel production will be, causing pressure on land and increasing land rent. This means that significant and continuous changes in fossil fuel prices, as well as sectorial support and promotion policies, will be reflected on the reduction of land availability for food, and this can cause a regular increase of household goods prices (Kretschmer & Peterson, 2008; Msangi et al., 2010). Figure 3 shows the impacts of the changes in the prices of labor and land rent resulting from the implementation of biofuels. It adapts a conceptual framework from bi-sectorial models with fixed production factors in order to analyze the effects of changes in oil prices, and the demand for energy sources derived from agricultural outputs (Corden & Neary, 1982). If the prices of fossil fuels have a significant increase, then the demand for biofuels rises. 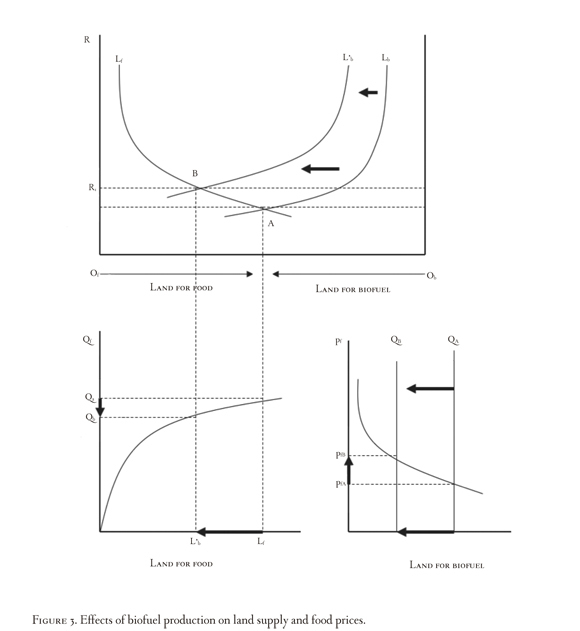 As a result, the curve of land demand is displaced from Lb to L'b. The new global equilibrium is located at point B. This implies that the land rents rise from R0 to R,. At the same time, the land used for food production experiences a reduction from Lf to Lf. Assuming that the number of workers inside the sector is constant, and then a smaller amount of land is reflected on a lower food production, which goes from to Qg. Finally, in the global market the reduction of food supply leads to a price increase, from PfA to Pg. Biofuels expansion can also generate additional income for agricultural producers, and exportations can contribute to economy growth by generating currency and new job opportunities. However, the results of the partial equilibrium analysis indicate that countries whose population is vulnerable and present malnutrition would not be able to acquire food in spite of their productive capacity or the food availability (Ewing & Msangi, 2009). What is at stake here is the problem of agricultural income distribution between large and small producers and consumers, and in the end this is the issue that defines the impact of biofuels on human wellbeing (Ewing & Msangi, 2009). Biofuels are an additional factor that increases competition for water and land in the agricultural sector. Even though the contribution of energy crops to global water demand in agriculture is rather modest. In 2008 it was estimated that only around 1% of the whole amount of extracted water for agricultural purposes is used to irrigate biofuel feedstock (IWMI, 2008). However, this varies locally and depends on factors such as cultivation type, soil type, weather, agronomic practices and efficiency of production technologies (De Fraiture, 2009). There still remains a lot to be studied about the impacts of biofuel production cycle on water resources. Berndes (2002) evaluated water consumption of different stages of biofuel production, indicating that the phase of feedstock cultivation consumes around 90% of the water needs, whereas the phase of industrial transformation uses 10%. Rosegrant et al. (2002) analyzed the role of water in agriculture, arguing that biofuel production affects the water resources most directly when they are used for irrigation and in industrial processes transformation, and also indirectly by increasing the water loss due to evapotranspiration, which otherwise would be available as runoff and underground water. However, De Fraiture and Berndes (2009) mention that 20% of the water requirements for energy crops comes from irrigation, mostly in northern Africa, southern Asia and the northern plains of China, while 80% is met by rainfall, mostly in Latin America and Europe. Other studies have focused on the concept of the "water footprint", proposed by Hoekstra (2003). 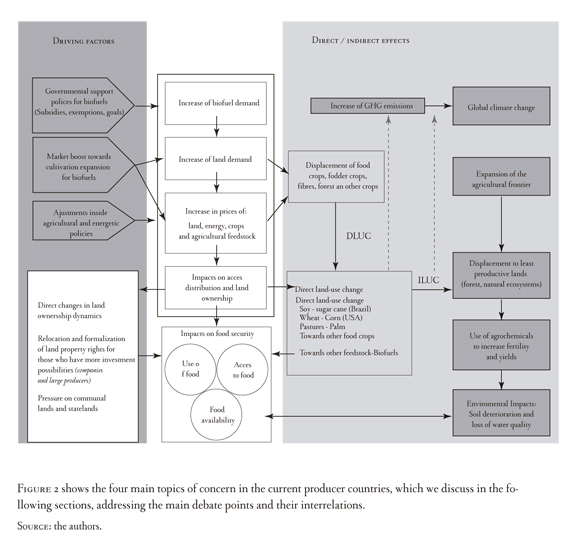 This concept relates to the direct and indirect uses of water through the production chain. Hoekstra et al. (2009) has demonstrated that depending on the kind of feedstock and climate conditions of the geographic region where the fuel is produced, the water footprint from energy biomass can be 70 to 700 times larger than the water footprint from fossil fuels. Recently, Lienden et al., (2010) estimated the future water footprint of biofuel production indicating that it could grow to up to 5,5% of the available "blue water" (liquid water) by 2030, and that the water footprint of the transportation sector would increase approximately 10 times due to the use of biofuels. A most obvious and visible effect is related to irrigation agriculture because the use of water from rivers, lakes, lagoons and swamps reduces the volume of the flow. This can dry up water bodies especially in dry seasons. River deviations, construction of dams and other infrastructures designed to retain and obtain water for agricultural purposes can cause important alterations in the hydrological structure, which in turn affects sedimentation and flooding patterns (Falkenmark & Rockstrom, 2006). On the other hand, draining peat lands and wetlands with agricultural purposes is one of the main causes of the loss of these ecosystems around the world (Finlayson & D' Cruz, 2005). There are several examples of the damages caused in wetlands due to biofuel expansion. In south-eastern Asia large areas of tropical peat lands have been degraded because of wood cutting and conversion from forests to oil palm plantations (De Fraiture et al., 2008). In Colombia diverse conflicts generated by water use in municipalities of the Orinoco region where oil palm plantations occur have been documented (Olmos, 2012). The most frequent conflicts are related to land reclamation to introduce new oil palm plantations or to expand current plantations. Most complaints relate to the alteration of gallery forests and wetlands, as well as excavation of drainage ditches or construction of irrigation channels. The communities have expressed their concern about the irreversible alteration of flows, superficial and underground water currents in those areas, leading to flooding phenomena from bursting of small rivers and channels that receive water flows above their capacity. Additionally, biofuel production and industrial transformation also impacts water quality of groundwater and water bodies because of contaminated runoff water with fertilizers, pesticides and herbicides, particularly on large-scale agriculture. In general, nutrient contamination turns into eutrophication processes. Moreover, when the underground water resources are used for biofuel production, there are changes in underground reservoir levels that may generate collateral damage such as soil salinization, such as observed in India, China, Mexico, USA and Australia (Siebert et al., 2010). However, the impacts derived from producing feedstock for biofuels on ecosystem services related to water resources are not particularly different from those observed in agricultural crops. In general, agriculture tends to increase the provision of some services (food, fuels, wood, and water), at the expense of other ecosystem services such as regulation services (underground water recharge, flooding control, and sediment control, among others), protection services, and supporting services (habitat, primary production, nutrient cycle) (MEA, 2005). A strong argument for promoting biofuel production and its use has been its contribution to the reduction of GHG emissions. In this respect, authors such as Fargione et al., (2008) and Searchinger et al., (2008) initiated the debate around the impacts, importance and implications of policies with respect to ILUC generated by first generation biofuels production. The study by Fargione et al., (2008) of peat drainage and forest clearing in Indonesia found that only the carbon emissions from peat decomposition is 420 times larger than the carbon savings from using oil palm biodiesel during one year. Searchinger et al., (2008) found that corn-based ethanol nearly doubles GHG emissions over 30 years. Achten & Verchot, (2011) evaluated the consequences of GHG emissions from land-use change in 12 case studies from 6 countries. The life cycles of different biofuel production systems were analyzed, including oil palm, jatropha and soy. Their results show that carbon debts range from 39 to 1,743.7 Ton CO/ha. Oil palm presents the highest carbon debt (472-1,743 Ton CO/ha) because its expansion mostly took place at the expense of tropical forests and peat lands. Overmars et al. (2011) estimated GHG emissions generated by ILUC from biofuel production in the EU using historical data. They found emissions to be substantial compared to those of traditional fossil fuels (84 g CO2 equiv/MJ): for ethanol ILUC emissions are 26-154 g CO/MJ and for biodiesel 30- 204 g CO2/ MJ, when the conversion emissions are spread over 20 years. However, there are critics to these studies, such as the lack of historical data that allow discerning the use of trajectories that precede the agro industry development and the lack of regional evaluations of land cover change at a high spatial and temporal resolutions that impede to identify dynamic changes (Carlson et al., 2012; Ellis & Ramankutty, 2008). There are no unified criteria to model land-use change impacts, and the models have gaps or assumptions that increase uncertainty with respect to the nature and magnitude of the calculated impacts (Young, 2011). Under these circumstances, policy makers are regulating ILUC without conclusive scientific proof related to their scale and intensity. In this respect Di Lucia, Ahlgren, & Ericsson, (2012) recommend that policy makers assume a preventive approach: although it does not assure that negative impacts from ILUC disappear, it does allow to lower the probability of negative impacts, by taking into account more adequate sustainability requirements and critical thresholds of GHG emissions. State policies that promote biofuel production create tensions and conflicts inside communities and organizations that are part of the civil society. This is not a well-studied topic in the general literature, but has been addressed by several authors in Colombia, which we use as a case to explore the issue. In Colombia, indigenous groups, afro-american and peasant communities often constitute a resistance front against the promotion and expansion of agro industrial energy crops in their territories (Roa & Toloza, 2008). They argue that the growth of these plantations disrupts their culture, ecosystems and community life. On the other hand, there are also conflicts between capital and work that reflect in union manifestations that stand for the defense of labor rights and are opposed to the cooperative model of Associated Workers (Roa & Toloza, 2008; CINEP, 2009). The main debate points relating biofuel policy and social conflict in Colombia are discussed below. for biofuel production are mortgaged over long time periods, the opportunity costs can be significant in terms of food production (OXFAM, 2012). Therefore, one of the challenges faced by rural communities is to make their social welfare, economy and culture visible through the preservation of their food security and autonomy (Salgado, 2010). A practice that is becoming common in tropical lands that produce commodities for biofuels is the subcontracting of workers and activities by enterprises through the cooperative model of Associated Workers and Strategic Productive Alliances (Dufey & Stange, 2011). These models of outsourcing hiring procedures are aimed at reducing costs of labor force, and land rent tend to impose asymmetrical conditions when it comes to the relations with workers. This allows the enterprises to access a low-cost labor force, bypassing legal protections implied in regular labor relationships (Seeboldt & Salinas, 2010). The biofuels business model tends to contribute to the consolidation of an entrepreneurial agriculture which, in tropical countries, strengthens the land concentration, characterized by the participation of landowner and investors who emphasize the land as a production factor, a source of income and an axis of local political power (Salgado, 2010). Under this model, rural communities such as indigenous, afro-american and peasants where property rights over their lands are not clearly established, tend to become secondary value as laborers or rural salary earners. This generates particular forms of integration and expulsion of rural population, resulting in an undervaluation of these communities as cultural subjects of the development processes. From this perspective, land property and socio-political recognition are important tools for these communities to build their life projects, maintain their identities and their sense of social belonging (Salgado, 2010). In countries facing internal conflict such as Colombia, the expansion of energy crops has, in cases, been associated with forced displacement, illegitimate and violent land appropriation and violation of human rights (Seeboldt & Salinas, 2010). In these cases, the enterprises related with biofuels industry have been accomplices by action or by omission, by allowing the entrance of armed groups and illicit cash flow in the entrepreneurial and politic ambits of the regions. The absence of a clear policy to repair for violence victims that would prioritize the return to land and property restitution, limits the possibilities for enterprises to establish projects with the legal land owners (Seeboldt & Salinas, 2010). The characteristic lack of censuses of property rights and ownership generates resettlement processes and legitimizes expropriation. This means that the communities disintegrate, and it is therefore often not possible to identify the head representatives of local communities who could be helpful in the mitigation and fair compensation of active losses generated by voluntary resettlements. The development and implementation of biofuels in many countries around the world during the last decade has raised serious questions against the optimistic promotion of biofuels as a solution to the energy crisis. One of the main arguments for the development of biofuels as substitutes for fossil fuels in the transport sector was its contribution to GHG mitigation: the impacts generated by direct land-use change (LUC) and indirect land-use change (ILUC) are often larger than the expected benefits. Although conclusive scientific proofs with respect to scale and intensity of the impacts are still needed, the state of the art recommends that policy makers assume a preventive approach, particularly in tropical countries characterized by high social and ecological vulnerabilities. It is necessary to refine methodologies, standardize criteria and models, and unify measurement languages and techniques, with the objective of achieving key consensus. Recent literature warns about the negative collateral damages from the expansion of energy crops on land prices and food production. It is demonstrated that the higher the oil prices, the stronger the bond between biofuels, changes in land prices and food security are. Significant and constant changes in support policies and promotion of this sector will be reflected on a reduction of land availability for food production, and on a constant price increase, which will have important consequences particularly in developing countries. Biofuels also intensify the competition for water. Impacts derived from production and expansion of biofuels on water resources has not been profusely studied. The more visible effects are related to river deviation and draining, construction of dams and infrastructures that cause serious alterations in hydrological structures. Moreover, the main reasons that explain the loss of water ecosystems in the world are the drainage of wetlands, swamps and peat lands to cultivate raw materials, as well as the dumping of water polluted with fertilizers, pesticides and herbicides. Energy crops expansion can also have an influence in conflicts of agricultural production and rural land property, especially in developing countries that lack of modern institutional infrastructures or unclear assignation of property rights. Organizations that are part of the civil society have expressed their concerns about the negative effects of large-scale plantation models that supports biofuel production on rural populations, leading to the concentration of wealth and rural income, rural displacement and land dispossession. There is a great uncertainty about the magnitude of the impacts and risks that biofuels may have on human welfare, especially among the developing countries. Before promoting ambitious biofuels production, detailed diagnoses of the potential production that include the assessment of their ecological and social impacts are required.